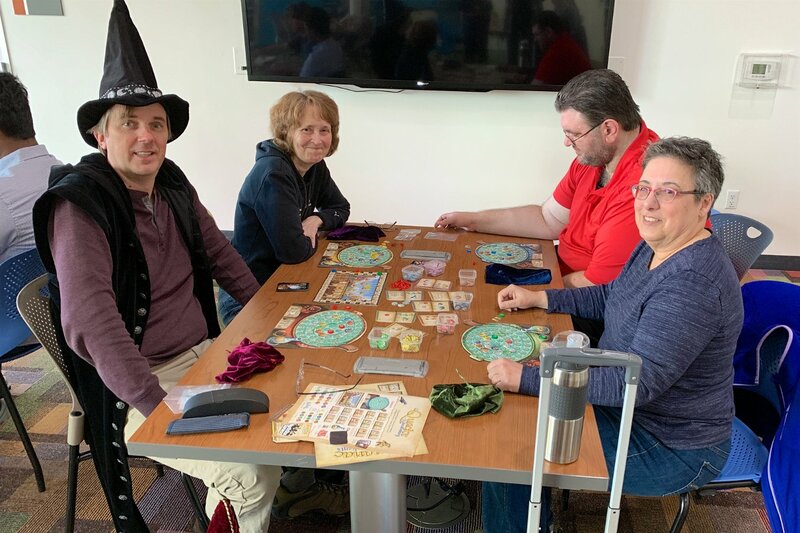 Darlene and I got in another game of Great Western Trail – not withstanding Pan’s attempt to thwart us. That picture was after having just finished setting up the starting game state – the first time. 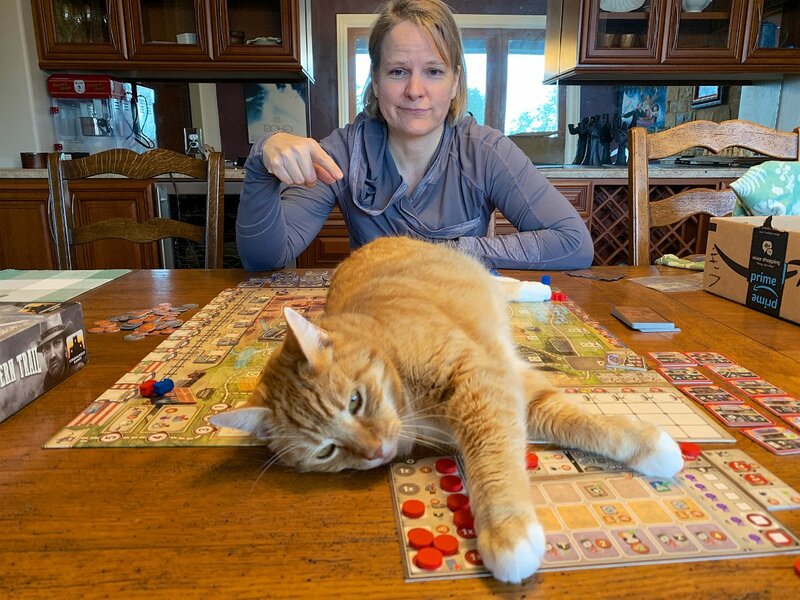 We had to herd him away from the table mid-game a few times after that to avoid disaster. At another gaming meetup, I finally got the hidden traitor game Dark Moon back to the table again and incorporated some of the Shadow Corporation expansion into play with six players but it went very strangely. 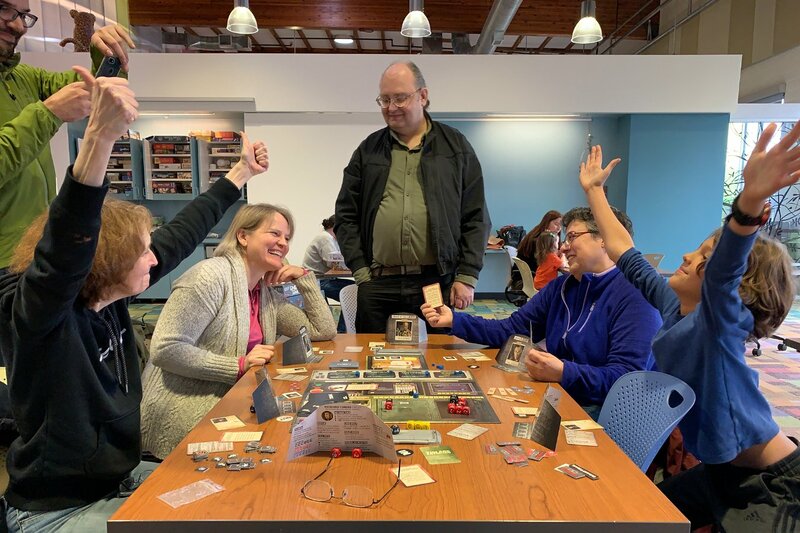 All of our dice rolls were so lucky that we completed all four events in just one round and a half of play – without really any intrigue of trying to suss out the infected players. Lame. Will have to try again. 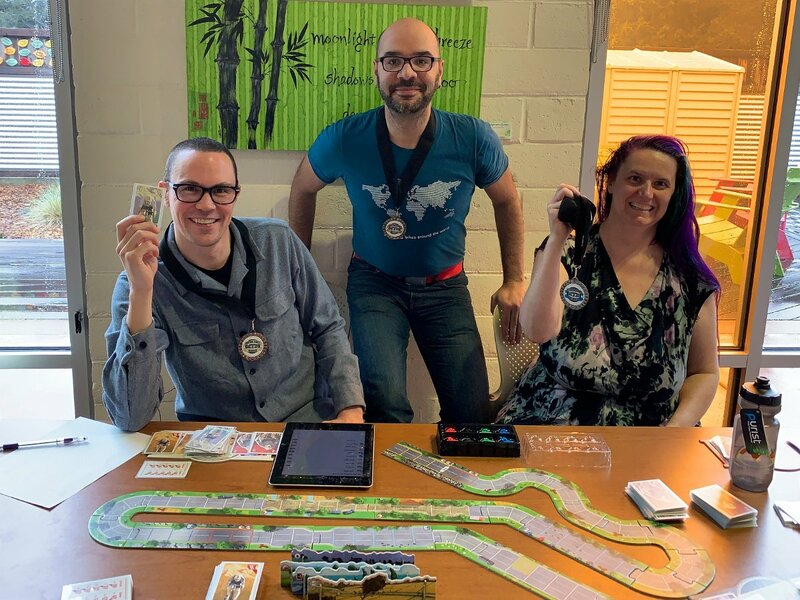 Meanwhile, others were engaged in a multiple-hour, six-player, three-stage bike racing series championship with Flamme Rouge. Darlene and I were introduced to the dice-rolling Space Base game and we introduced others to a quick three rounds of Cheaty Mages. On a Wednesday night, five of us attempted to summit K2 and alas, one of my climbers and somebody else’s were caught up top in a blizzard and died. Very sad. Kat came through though with maybe just a little frostbite to win the game. At a Saturday gathering, I introduced the group to Quacks of Quedlinburg, in appropriate costume of course! Several of us managed to max out our potion-brewing cauldrons – but then I did forget a rule about when you’re allowed to use the neutralizing agent. Oops. After that I tried a game of Whistle Stop for the first time – that one was interesting, but a bit slow with five players. Darlene and I also introduced her niece Joslyn to some board games while she was here for a week visiting from Wisconsin. Besides Quacks of Quedlinburg, Bärenpark and Evo, we made a first run on the new spin on cooperative, crime-solving detective games, Chronicles of Chrime. This game uses an app to allow you to explore a crime scene and related locations in virtual reality and has you prompting characters with the various bits of evidence you find to gather more clues and eventually piece together a solution to the criminal mystery – all while consuming in-game time that allows the situation to evolve. Pretty cool!